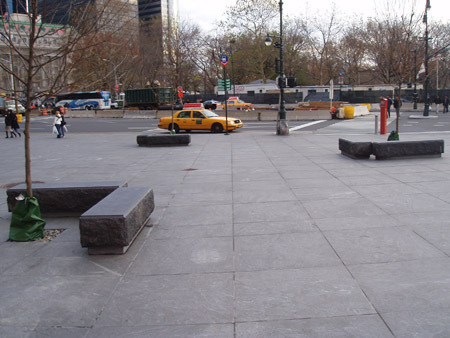 Spot: Although there is hardly a lack of ledges downtown, most of them suffer from a five-minute bust factor ‚ and this one just happens to give you an actual chance of skating for maybe fifteen minutes, not five. So essentially, you’ll get kicked out after you’re done warming up, not while you’re warming up. 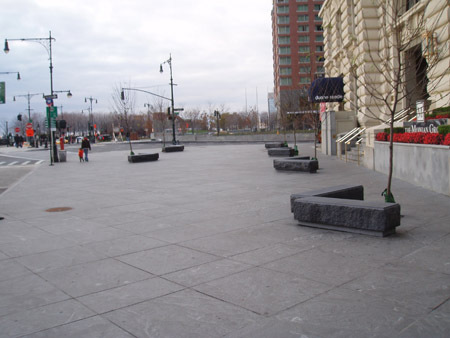 The entire front of this plaza is on smooth marble ground, and sprinkled throughout with these four-foot long, average-bench height ledges. The edges below the lip are somewhat rigid, so you cannot do tailslides or noseslides, but otherwise, every other trick is possible. 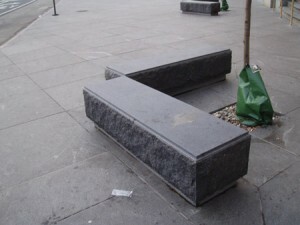 Bust — ♦♦♦♦ / Very Likely: It is slightly less of a bust than many other bench / ledge spots downtown, but that is not saying much. During the weekends and weekdays, it usually takes less time for you to get kicked out, because building residents will typically complain on their way back home to the doorman, so he will come out and tell you to beat it. If you come here at night, your chances are significantly better, but not a no-kick-out guarantee by any means. There are tons of cars in the street here entering the Westside Highway, so be careful of your board running into the middle of the street. Location: Battery Place and West Street, right where the Westside Highway begins by the South Street Viaduct to the FDR. Take the 4 or 5 to Bowling Green, and skate west on Battery Place for several blocks. The spot is on the northern end of Battery Place, across from Battery Park.